This was a project I actually completed for a client back in December but finally got time to share on my website today. My clients are full of style and love a preppy look! Think Bow Ties, Monograms and Crisp Bright Geometric prints….they are always the most well dressed family! Their toddler son literally does don a bow tie at all social events….He is probably the most adorable toddler in Michigan! 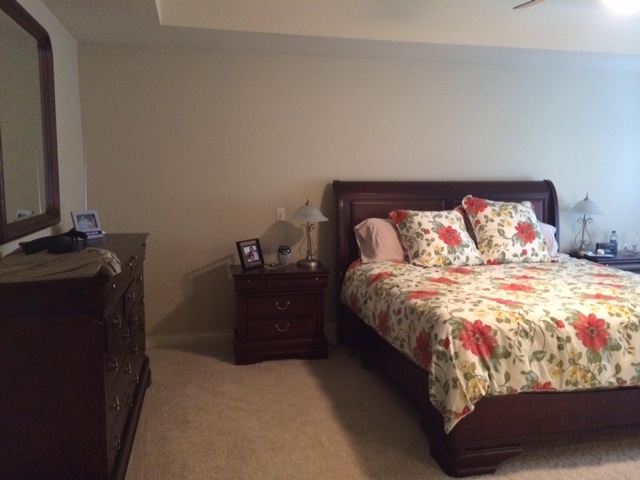 So, when my clients were expecting baby #2, it was time to dress up that master bedroom since they knew there would be many sleepless nights in their future again. They wanted to make it a sanctuary and it to really reflect their personality. The before picture doesn’t do it justice. It was so plain and boring….not at all like this couple! 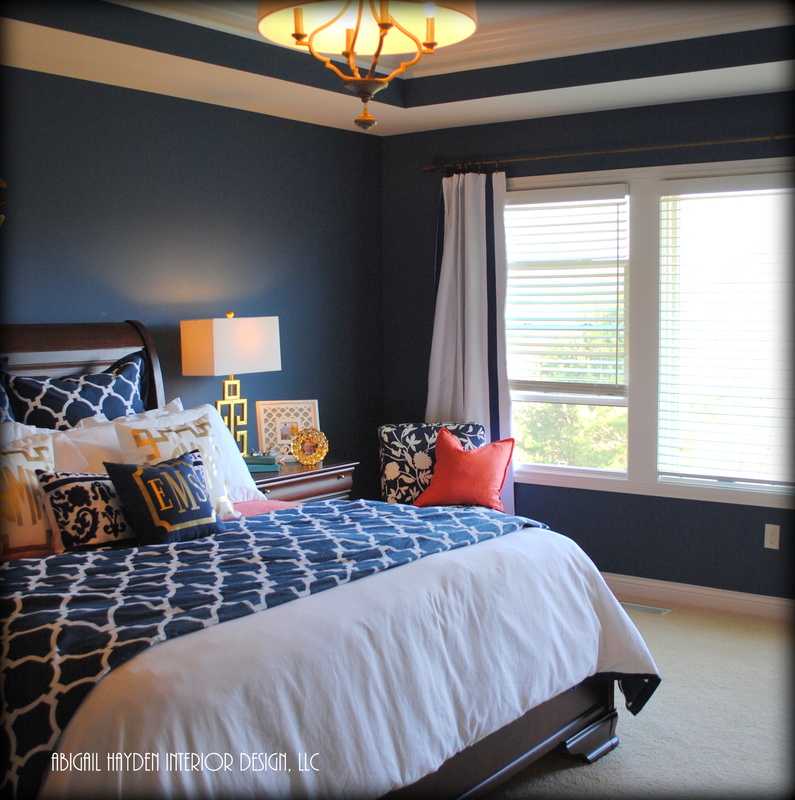 We painted the walls Benjamin Moore Van Duesen Blue to match the Jill Rosenwald bedding. 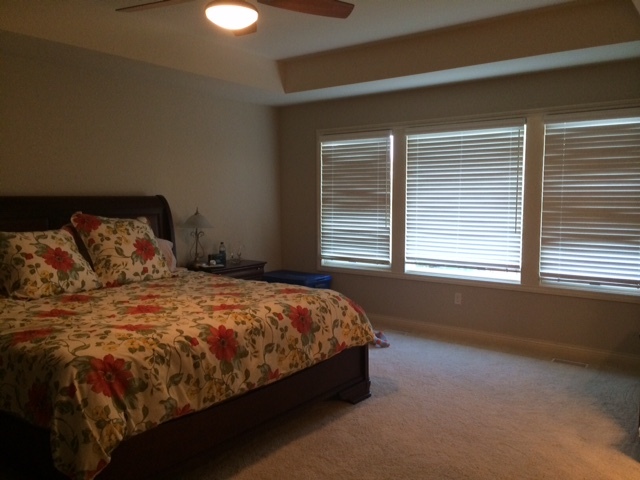 Unfortunately all of the trim in the home is this buttery cream color so the ceilings, trim and doors all needed to be repainted Benjamin Moore White Dove. Lesson to be learned when buying a builder spec home….make sure you consider the trim color in the house. My clients love crisp white trim and boy, was it expensive for them to change it all in a house that was only 3 years old! The bedding was a crisp Navy and White. 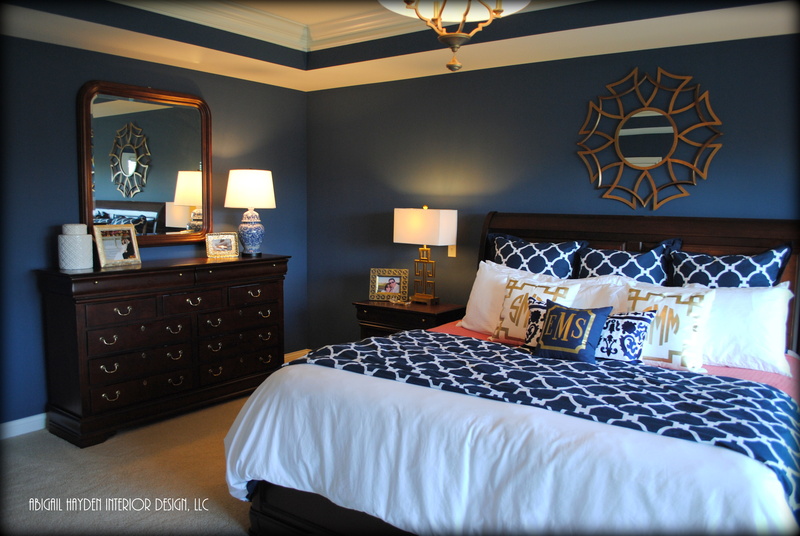 We painted the walls navy to add warmth to this large room and then accented with pops of coral. 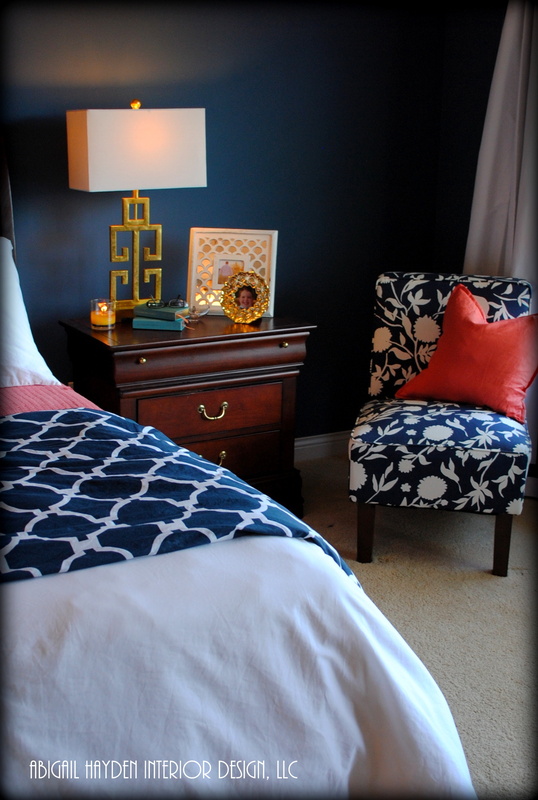 We also brought some gold accents in with lamps, monogram pillows and a new chandelier. I love that my client did not shy away from gold metallics! I am trying to squeeze it back into clients homes because gold is very trendy right now when used properly. Unfortunately, the brass of the 80’s still lives in everyone’s memory and midwestern clients are always on the conservative side. So here is the big reveal….. I love how this room turned out….and what I love more is that my clients bring guests upstairs to show it off every chance they get. They even had the newborn family photos taken in this room. The fact they love it that much makes my job all worth it! !